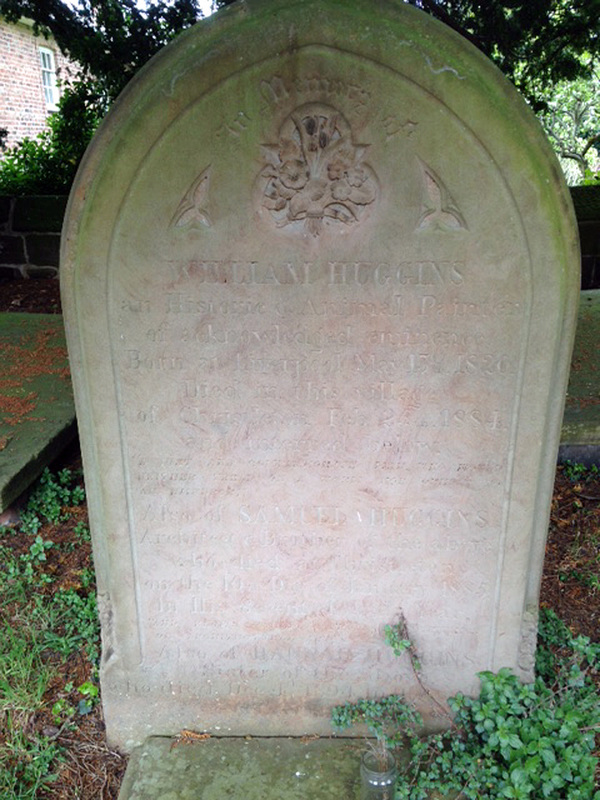 William Huggins was born on 13 May 1820 in Liverpool, the son of Samuel Huggins and his wife, Elisabeth. He had a younger brother, Samuel, an architectural historian, and two sisters, Sarah (1853-1865) and Anna (1854-1862). He never saw big cats in their natural environment and consequently his backgrounds were understated. However, their subtlety served to focus all attention on the powerful depiction of the animals themselves. The influence of George Stubbs, which Huggins readily acknowledged, may be seen in his early painting of two pumas. In mid-career Huggins developed the highly individual technique that characterized some of his best work. Having first drawn a pencil outline on smooth white millboard, he then glazed in oils, which allowed the white background to show through, creating a luminous effect. Huggins first exhibited at the Royal Academy in 1842 with Androcles and the Lion, then became a regular exhibitor until shortly before his death. His connection with the Liverpool Academy began when he attended life classes as a student. He was elected an associate in 1847 and a member in 1850. His active connection ceased in 1856. He also exhibited at Manchester, Dublin, Edinburgh and Glasgow. 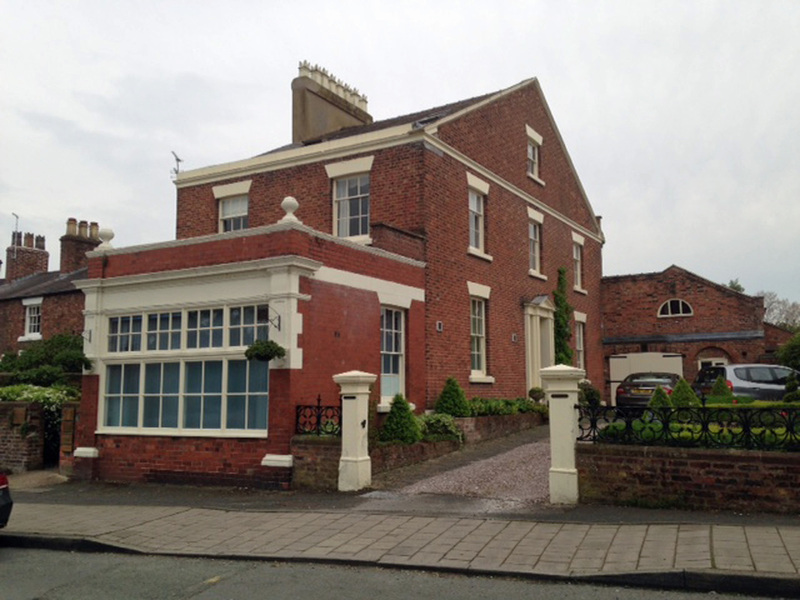 In 1861 Huggins moved to Chester, where he lived with his brother. ​It was presumably under his influence that he took up architectural drawing and he painted many views of the city. He developed a particular liking for its red sandstone, which featured prominently in his later works, The Ruins of St John’s, Chester and View from St John's, Chester, plus a general view of Chester from the other side of the river. In 1876 he left Chester for Betws-y-Coed, where he painted landscapes including The Fairy Glen, exhibited in Liverpool in 1877. He eventually settled at Rock House in the village of Christleton in Cheshire. The oil painting depicts Emily Jordan with her three brothers: from left to right, Harry (2), Emily (4), Thomas (9) and Charles (7). Emily Jordan was the mother of the donor, Miss Margaret Jessie Gourlay. It was painted in 1845. We can see that Harry was wearing a dress, which he would have done up to the age of five or seven years, until he was 'breeched'. Breeching was the occasion when a small boy was first dressed in breeches or trousers. From the mid-16th century until the late 19th or early 20th century young boys in the western world were unbreeched and wore gowns or dresses until an age that varied between two and eight. Breeching was an important rite of passage in the life of a boy, looked forward to with much excitement. It often marked the point at which the father became more involved with the raising of his son. The donor was Margaret Jessie Gourlay, born in 1871 in Birmingham, West Midlands, to Emily Pearson Jordan (1841-1934), born in Wolverhampton and William Gourlay (1836 -1917), born in Newton Stewart, Wigtownshire, Dumfries and Galloway, Scotland. Margaret’s mother, Emily Pearson Gourlay (nee Jordan), was the little girl in the painting of the Children of the Jordan Family. In 1851 Emily Pearson Jordan lived in Edmonton, Middlesex, with her parents, Sarah, born 1814, and Thomas, born 1812. She had six brothers and one sister. In 1851 Emily’s husband-to-be, William Gourlay, was living at the High Street, Penninghame, Wigtownshire, with his parents, three sisters and two brothers. His father was a watchmaker and he became his apprentice. In 1861 William was living in lodgings at 48 Howe Street, Aston, Birmingham and, having served his appreenticeship, was working as a watchmaker. Emily was living with her mother, Sarah, and seven siblings, her father, Thomas, having died. Somewhere their paths crossed and they married in 1863 in Staffordshire. The next census was in 1871 but their movements can be traced by the places their children were born: in 1865 their son, James W, was born in Coventry, as was their daughter, Ellen C, in 1866. They then moved up to Glasgow, where they had another daughter, Emily, in 1869, before returning to Birmingham, where Margaret Jessie, the donor, was born in 1871. On the 1871 census we find them living in Chorlton-on-Medlock, Lancashire. The 1881 census recorded their address in Barton-upon-Irwell, Lancashire. William was a watchmaker jobber and his son, James, was an apprentice. By 1891 they had moved to 11 The Groves, Eccles, Lancashire. William was a watchmaker to the trade but James had moved out of the family home. Their eldest daughter, Ellen, was a dressmaker, Emily was a boot and shoe shop woman and Margaret was an embroiderer. In 1901 the family had moved to 84 Lord Street, Blackpool. William was still a watchmaker jobber but working for himself at home. Ellen was unemployed and Emily had beccome a boot and shoe keeper on her own account, employing her sister, Margaret, as an assistant. In 1911 their address was 8 Park Road, Blackpool. Emily was now 70 and her widowed sister, Annie Maria Jones (nee Jordan), aged 63, had moved in with them as a help and companion. Emily and Margaret were both boot and shoe dealers. William was visiting friends in Bournemouth during the census and was reported as being a retired watch maker. William died in the Fylde district in 1917, aged 81, followed by Emily Pearson in 1934, aged 93. On 25 July 1955, Margaret Jessie Gourlay of 57 David’s Road South, Lytham St Annes donated the painting to the Lytham St Annes Art Collection, prior to moving to 19 All Saints Road. Her final place of residence was the Kingstown Nursing Home in Lytham St Annes, where she died on 2 June 1957. Councillor Crook reported the gift of the following paintings at the Council meeting held on 25 July 1955, all donated by Miss Margaret Jessie Gourlay of 57 St David's Road South. New Forest, Hampshire (w/c) Fred Hines.